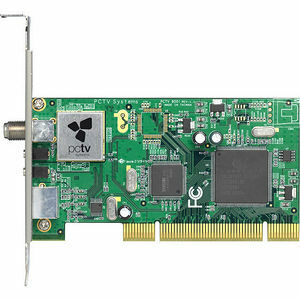 PCTV HD Card brings SD and free HD TV to your PC with no desktop clutter. It is a HD Card that brings the sharpness of HDTV via the new ATSC standard to your PC. ATSC is the new digital TV standard, and it comes over-the-air and for free in high or standard definition. There are absolutely no required subscription fees. Watch, time shift and even automatically record all of your favorite HD and SD TV shows. It fully supports both analog (NTSC) and digital (ATSC) TV signals; the tuner hardware is also ready for ClearQAM (unencrypted digital cable). Thanks to the included TVCenter software, record programs on your hard drive in MPEG-2 or DivX or even direct-to-DVD. Pause, rewind and fast-forward live TV with time shifting. Capture SD video from a camcorder or set-top box using the included adapter cable. There's never been an easier way to turn a desktop PC into a HD TV with fully functional personal video recorder (PVR).